A record 500 guests attended the tenth annual Eclipse Proclaim Personal Injury Awards in Manchester last night. 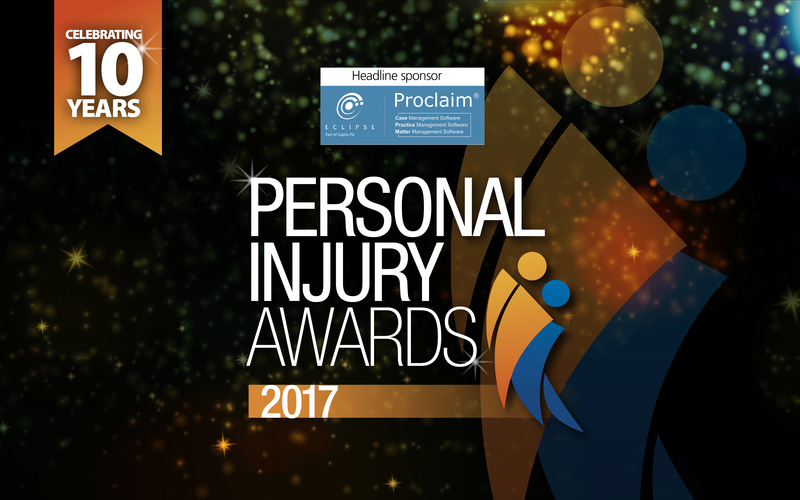 The 2017 Eclipse Proclaim Personal Injury Awards recognised the industry’s battle for greater access to justice and care. The awards took place at the Hilton Manchester Deansgate. The black-tie event was organised by Barker Brooks Communications, the publisher of Claims Media. Switalskis Solicitors and its team won three awards, including Claimant Personal Injury Team of the Year. Judge Frank Burton QC, of 12 King’s Bench Walk, said the Switalskis team “has been at the forefront of managing sexual and physical abuses against children for a whole generation”. David Greenwood, who leads the Switalskis child abuse compensation team, was named Claimant Personal Injury Lawyer of the Year in recognition for his work in this area, while Janet Baker, who heads up the firm’s clinical negligence team in Sheffield, was crowned Clinical Negligence Lawyer of the Year. Hilary Meredith, of Hilary Meredith Solicitors, won the Outstanding Achievement award. Meredith has “campaigned tirelessly for major policy reform in the way that military personnel are handled when they’ve suffered from post-traumatic stress disorders and other psychological injuries”, according to judging panel chair Deborah Evans, who is chief executive of the Association of Personal Injury Lawyers. Maggie Sargent was another big winner, picking up the Lifetime Achievement award for her 30 years of service in dealing with personal injury and medical negligence claims for both claimants and defendants. Maggie Sargent & Associates was also named Medicolegal Provider of the Year. The rest of the judging panel for the 2017 Eclipse Proclaim Personal Injury Awards included: Laurence Besemer, CEO of the Forum of Insurance Lawyers; Paul Nicholls, senior partner at Nicholls Brimble; Michael Stubbs, practice director at Parklane Plowden Chambers; Helen Merfield, managing director at Plexus HealthCare; Charles Layfield, board director, head of legal and company secretary at Minster Law (part of the BHL UK Group); and Stephen Webber, partner and head of both the clinical negligence department and claimant division at Hugh James Solicitors. Comedian and writer Hal Cruttenden, who has appeared on Mock the Week, Live At The Apollo and Have I Got News for You, hosted the 2017 Eclipse Proclaim Personal Injury Awards, which was attended by guests from across the personal injury sector, and the country. Photos from the Eclipse Proclaim Personal Injury Awards will be available to view on the Claims Media website soon.